ClubCoins Nødvendigt: 475 Please note that, for now, you cannot download content from our platform directly onto a mobile device (phone, iPod, iPad, tablets...). You need to download your items onto a PC or Mac, and then transfer them onto your device in the normal way. We are working on allowing direct downloads to mobile devices but this is not possible in the current version of the platform. Sorry about the inconvenience! 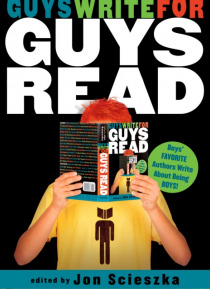 This fast-paced, high-energy collection of short works features today's most popular writers and illustrators on what it means to be a guy. Contributors include Chris Crutcher, Stephen King, Matt Groening, Daniel Pinkwater, Neil Gaiman, and many more.